During Quaternary glaciations, the ranges of Northern Eurasia forest species periodically experienced contraction followed by subsequent re-colonizations in the interglacial intervals. However, unlike the broadleaf trees of temperate forests, taiga species seem not to have retreated fully to southern regions in unfavorable periods and possibly survived at mid-latitudes in multiple refugia. 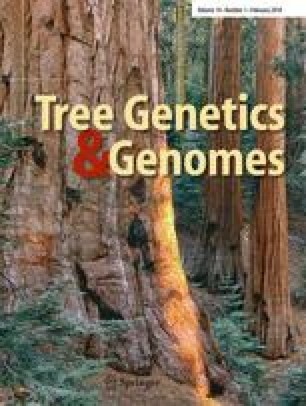 Here, we report a study of genetic variation of three mitochondrial DNA markers in 90 populations of Scots pine (Pinus sylvestris) located from Eastern Europe to Eastern Siberia. The geographic distribution of seven mitotypes demonstrated the split between western and eastern populations approximately along the 38th meridian. Genetic diversity in the western part was significantly higher than in the eastern one. Five mitotypes were western- and one eastern-specific. One mitotype was common in both regions, but in the eastern part it occurred only in the South Urals and adjacent areas. The geographic structure in the mitotype distribution supports a hypothesis of post-glacial re-colonization of the studied territory from the European and Ural refugia. The online version of this article ( https://doi.org/10.1007/s11295-017-1222-0) contains supplementary material, which is available to authorized users. The authors further acknowledge EG Phylippov, SN Sannikov, KG Zatsepina, S. Jamiyansuren, AK Ekart, LI Kalchenko, and RV Rogovtsev for the material collection and OS Dymshakova, NV Semerikov and MA Polezhaeva for the laboratory assistance. The authors thank two reviewers and the Associate Editor for useful comments, corrections, and suggestions that greatly helped us improve our manuscript. VLS, VVT, AIV, and KVK collected the samples, generated and analyzed data, and wrote the manuscript. SAS and IVT established the experiment, isolated and genotyped DNA, and helped with the sample collection. YAP and NVO helped with marker development, sequence analysis, data interpretation, and manuscript editing. All authors read and approved the final manuscript. This study was funded by the research grants No. 16-04-00607 from the Russian Basic Research Foundation and No. 14.Y26.31.0004 from the Government of the Russian Federation. A list of the population samples including mitotype frequency is provided in Supplementary material Table S1. Sequences used in the study were deposited in GeneBank (KY302807, KY302806, and KY302808).